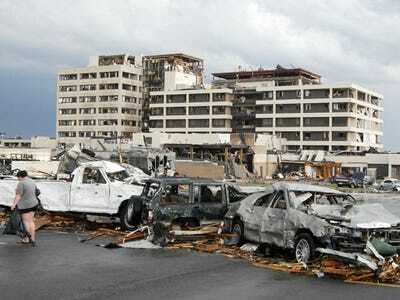 A devastating tornado swept Joplin, Missouri away last night. Joplin is about an hour away from where I live, and the common destination of many people in my family, as it sits near the state border where casinos are legal (Missouri is anti-gambling). At least 89 people have been confirmed dead. Please keep the victims and their families in your thoughts. In other, happier news, I submitted for publication a short 5k story over the weekend; it's very sexual, and deals with a relationship between step-siblings. Just a fair warning to anyone who might think "ick!" - I actually don't consider this as taboo as others might; I didn't grow up with step-siblings. Still, from experience, I know it is a touchy subject for some. My CPs assured me I handled the matter delicately, though, so hopefully you guys will still respect me in the morning. I have four days to go until my month o' vacations commences. Right now, I just want the storms to go away.